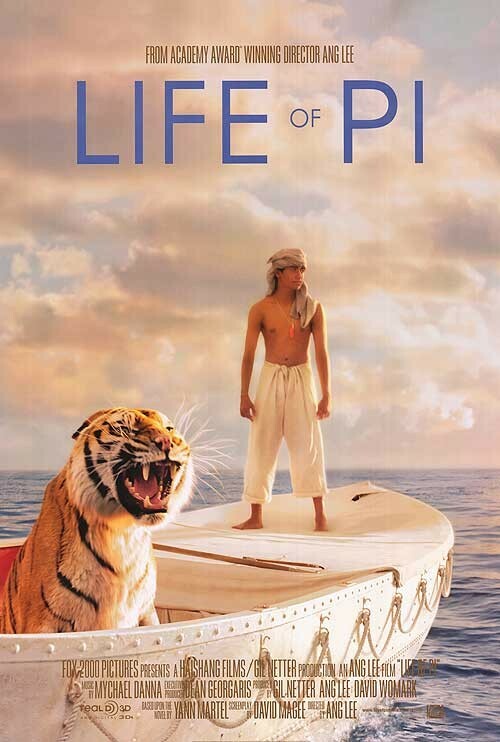 Ang Lee’s Life of Pi is a lot of things — beautiful, visually impressive, ambitious, and ultimately, shallow. The film tells the story of Pi Patel and his unbelievable life, as presented by a middle-aged Pi (Irrfan Khan) to a writer looking for new material. Pi recounts his days as a child, when he would humorously take in bits from several religions to create his own vision. His parents owned a zoo in India, and all was well until his father decided to sell everything and move to Canada. On the ensuing voyage, a nasty storm destroys the ship, sending humans and the wild animals onboard flying violently into the middle of the ocean. The teenage Pi (Suraj Sharma) finds himself separated from everyone else, somehow ending up alone on a boat with a Bengal tiger named Richard Parker. This is the segment of the film that most will recognize beforehand. 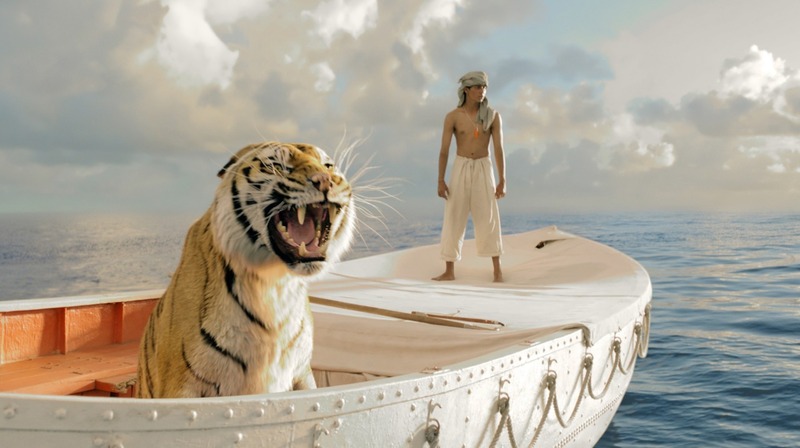 Yes, Pi is stranded in the Pacific Ocean with a tiger, and yes, this represents a good chunk of the film. My initial concerns, having not read the novel that this is based on, were that this would be a wild fantasy in which the tiger is made to be a cuddly feline rather than the dangerous predator it really is. Thankfully, that is not the case here, as Pi is very much afraid of Richard Parker, and the tiger is ill-concerned with befriending a human. The problem here is that there is little suspense during this segment. During the beginning of the film, we are shown the middle-aged Pi as he sits down to talk to the writer. There is nary a scratch on him, or any evidence that he had survived a traumatic experience like this shipwreck. As such, we know right away that he will survive this endeavor, and the tiger feels much less threatening as a result. This lack of impact is especially noticeable once the ending hits, when a revelation suddenly threatens to make the film all for naught. The climax also laughably spells out Pi’s final statement a second time for the audience, just in case it wasn’t clear the first time around. Early in the film, the middle-aged Pi boldly states that his story will make the writer believe in God, thereby making us (the audience) do the same. While Pi’s story raises some interesting questions regarding faith and the structure of beliefs, he is greatly overstating his tale. Those expecting a groundbreaking revelation would be better served looking elsewhere. Even though Life of Pi falls short of its lofty ambitions, it’s impossible not to bask in its sheer beauty. This is one visually stunning film, aided immensely by some of the best CGI that I have ever seen. The tiger fits in seamlessly on board, and the young Sharma plays off of it perfectly. The shipwreck scene is loud, boisterous and frightening — especially when seen in 3D. I would be shocked if this doesn’t get an Oscar nod for Best Visual Effects (and Best Cinematography, for that matter). It’s a shame that there isn’t a more meaningful story underneath Life of Pi‘s alluring outer shell. Ang Lee deserves credit for bringing this novel to life with a vision like only he can, but a weak conclusion dampens what is already an anticlimactic adventure. The movie looks interesting, will see it when I can. This is basically where the author stole the story from. Wow. Hadn’t heard about that. Not sure if I buy Martel’s story that he got the idea from a book review. I wasn’t overly interested in the film from the trailer although it looked visually stunning. From your review it reminds me a little of Burton’s Big Fish in relation to someone retelling their own story and presumably embellishing along the way. I’m guessing it isn’t anyway near as fun. There are definitely some similarities between Life of Pi and Big Fish. That would be an interesting double feature, actually. I’d say give this one a shot — you might like it more than I did. I’m seeing this Sunday and rather looking forward to it. I haven’t read the book or anything so am hoping this is in my benefit. Will revisit this review once I’ve seen it, I’m hoping the visual stunningness is enough to keep me awake for the most part. I’ll keep an eye out for your review, man. Curious what you’ll think of it. Although I liked it a lot more, I would have to cede your two main gripes you express. 1) The “Flashback” structure of the film does allow audiences to know the entire time that Pi will live 2) That “revelation” at the end does undercut a LOT of what they had built. Still, I enjoyed it very much, and I’m pretty sure its going to be in the mix come Oscar time…. Heh, no hating going on here, just apathy. I’m glad you got more out of this than I did. It seems most have as well. Good review Eric. The story may not be as strong as it’s visuals are, but that doesn’t matter when you think of how this is probably the best use of 3D so far. Seriously, every shot is a frame of absolute beauty. Thanks Dan. I thought Lee did a good job with the 3D, but it wasn’t entirely necessary. Not worth the $15 to see it that way, anyway. Great review! It does look like style over substance to me, your review only confirms it. Just like with Cloud Atlas I’m really not interested in seeing that. Thanks, Sati. I was hoping for a little more depth, I guess, and this just left me disappointed. Haha, thanks man. Yeah, I can’t say this one has stuck with me either. Glad you dug it, though! I love reading this review, Eric. you had me hooked as soon as you said it ultimately was shallow. After reading so many positive reviews I couldn’t wait to read what you didn’t like. I do agree with your points. although, for me, they didn’t keep me from enjoying it so much more. even after a 2nd viewing. I found so much to be well done in the symbolism, visuals, performances, etc. but certain revelations, as you state, did take us out of the story a little. For me, though, one of the best films of 2012. A well thought out review man. Thanks for the kind words, man! I’m glad that you and so many others have enjoyed this more than I did. I really wanted to love this movie — and the visuals drew me in unlike any other recent film — but it never came together the way I hoped.